1682  Earliest known date of existence when The Ponds was born through land grants. Andrew Percival was the first owner of record of the 2,000 acre tract. He established a "fortified plantation" on the property (1, part 2) (3, part 1). 1716  The Yemassee Indians became unhappy with the English abusing their rights and encroaching on their land which lead to a massacre on April 15, 1715 in Pocotaligo. This upheaval spread throughout the Lowcounty. Plantation owners fled to Charleston leaving their property unprotected from the Indians that were invading. In 1716, Colonel George Chicken and his militia marched north from The Ponds Plantation and defeated the Indians (3, part 1 & 2). 1723  The Donning family became owners of the plantation (1, part 2). 1765  The Donnings sold the plantation off in pieces (1, part 2).
?  William Henry Drayton owned The Ponds and raced horses at the plantation. Drayton repeatedly mortgaged The Ponds in an attempt to pay off other debts (3, part 2). 1818  John Schulz purchased The Ponds (1, part 2). 1830s  The current house was built and was the third one to be constructed at The Ponds (1, part 1). 1865  The Schulz family sold the plantation to Edward Lotz (1, part 2). 1911  The Simmons family purchased The Ponds and worked the land as an active sweet potato farm, raised cattle in the 1950s and then leased much of the property as fishing and hunting land in the late 1900s (1, part 2) (3, part 1 & 2). 2006  Greenwood Communities and Resorts purchased the plantation and developed it into a housing community (1, part 2). 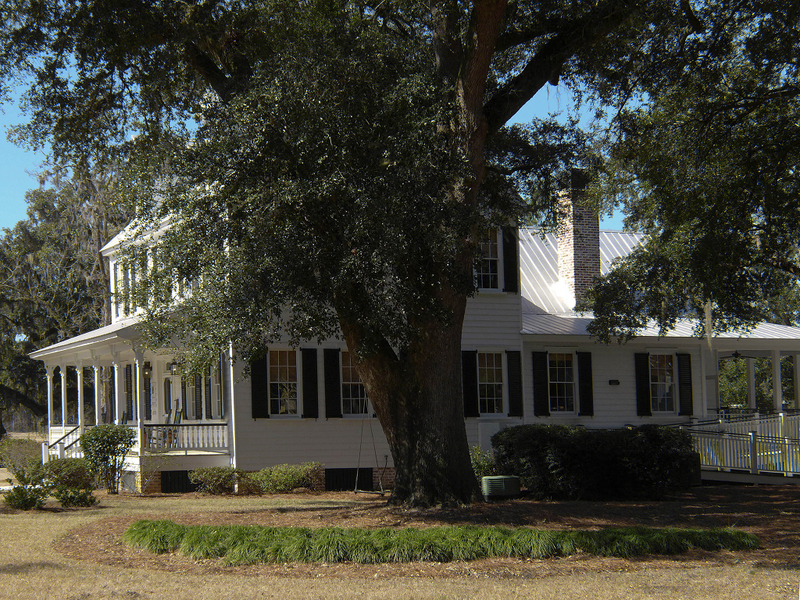 The house that is currently standing is the third to be built at The Ponds Plantation. It has been restored and is currently used as the main amenity center for the housing community (2).